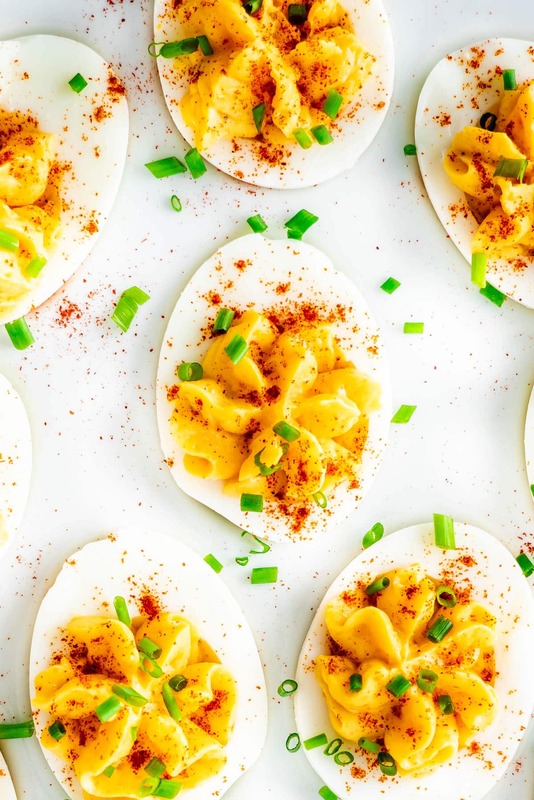 These Classic Deviled Eggs are devilishly delicious and perfect for an appetizer. Their simplicity makes them ideal for every occasion, yet elegant enough for the big holidays! Deviled eggs are one of my favorite appetizers and this is my favorite recipe. It’s a classic deviled egg recipe, but it still is one of the best out there. 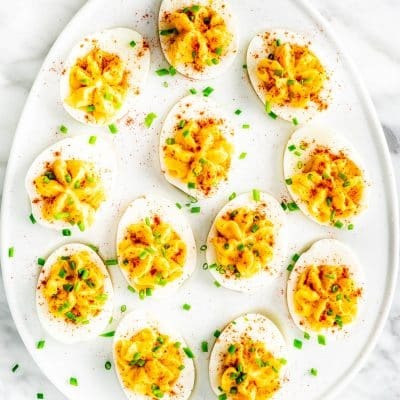 Deviled eggs are a great appetizer because they really are perfect for any occasion, plus they’re a favorite at Easter. These deviled eggs are so great that I find it difficult to really eat just one. I love them so much I can easily inhale at least half a dozen. My only issue is having to peel the eggs perfectly, however I have mastered this. See below instructions for how to perfectly hard boil eggs and peel them. Deviled eggs, sometimes they are spelled devilled eggs, are also known as stuffed eggs, Russian eggs or dressed eggs. 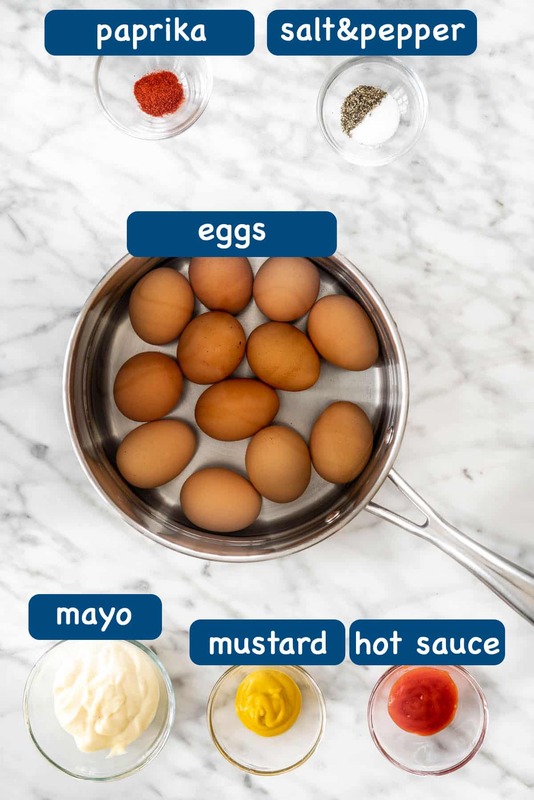 While they go by many different names, they are essentially hard-boiled eggs that have been peeled, cut in half and then filled with a paste made from the egg yolks mixed with mayonnaise, mustard and other spices. 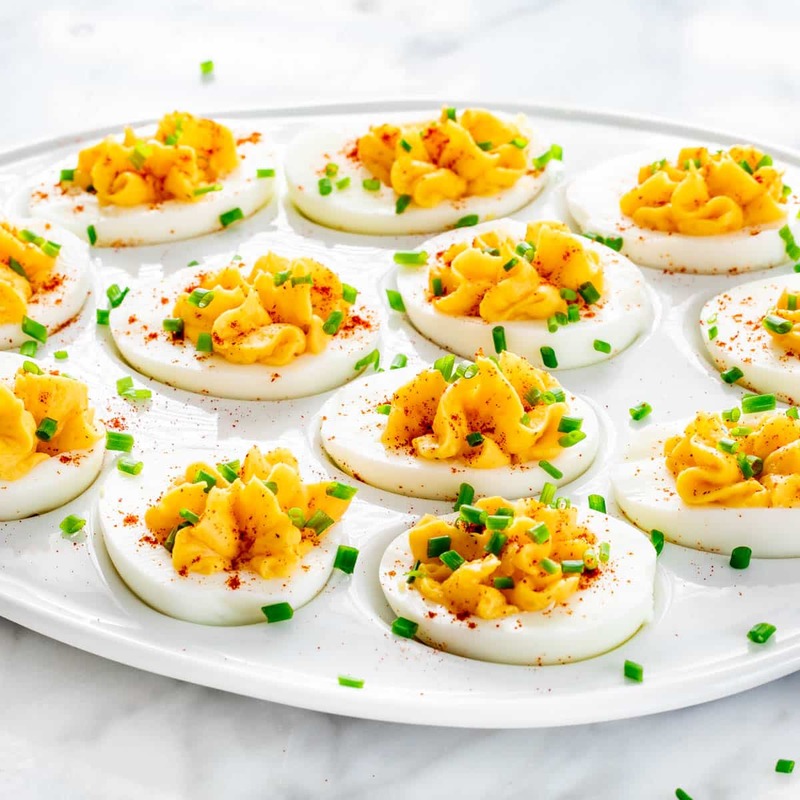 They are called deviled eggs because in the 18th century, the term “deviled” came to be used in reference to spicy or zesty food, including eggs prepared with mustard, mayo and the egg yolk. Here’s what you’ll need to make these eggs. 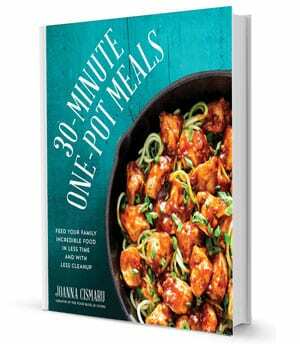 Make sure to scroll down to the recipe card for complete printable recipe. Hard-boiled eggs – when it comes to peeling eggs, the secret is to use 5 days or older eggs. 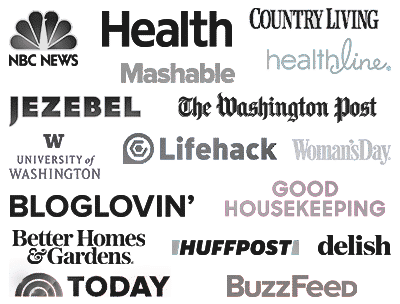 Mayonnaise – I love using a good organic mayonnaise. You can also make your own mayo. To make your own mayo all you really need is an egg and 3/4 cup vegetable oil. Place them in a cup and use a an immersion blender. Within a few seconds you’ve got homemade mayo. Salt and pepper – use as much or as little as you want to perfectly season the eggs to your liking. Mustard – any regular yellow prepared mustard will work. Hot sauce – I’d say this is optional, however these are “deviled eggs” so trust me you’ll want to add some, and a little goes a long way. Paprika – I love using smoked paprika for garnish, but sweet paprika will work just as well. Chives – this is optional but I think it makes the eggs look really pretty. There are so many tips and tricks out there on the internet and we have tried them all. Many have failed, and this method has given us perfect eggs every time without a single egg giving us a hard time! Bring the water to a boil. Don’t let the eggs sit in the water as it comes up to heat – wait until the water is hot. Drop the eggs in cold – straight from the fridge. Don’t let them come to room temperature first. Also, avoid using any eggs that have a hairline fracture. It will become apparent right away when you place the egg in the water. Reduce the heat slightly, so the water is still boiling but not splattering all over the stovetop. Let the eggs cook for 11 minutes. We used large eggs, so you will have to adjust the time if your eggs are a different size. Transfer the eggs immediately to an ice bath. Make sure there’s lots of ice so the heat from the eggs doesn’t reduce the temperature of the water. Let them sit in the ice bath for 10 minutes. Lightly tap all around the eggs to crack their shells. Carefully peel pieces of the shell away using your thumbs. Underneath you’ll have a perfect hardboiled egg! Boil the eggs: Boil the eggs as instructed above. Slice the eggs: Slice the eggs in half and spoon out the egg yolk to a bowl. Place the egg whites onto a clean dry plate or platter. Make the filling: Mash the egg yolks with a fork then add the rest of the ingredients, with the exception of the paprika. Stir everything together. Fill the eggs: Using a small ice cream scoop fill the egg whites with the filling. Alternatively, you can use a teaspoon or a piping bag to pipe the filling into the egg whites. 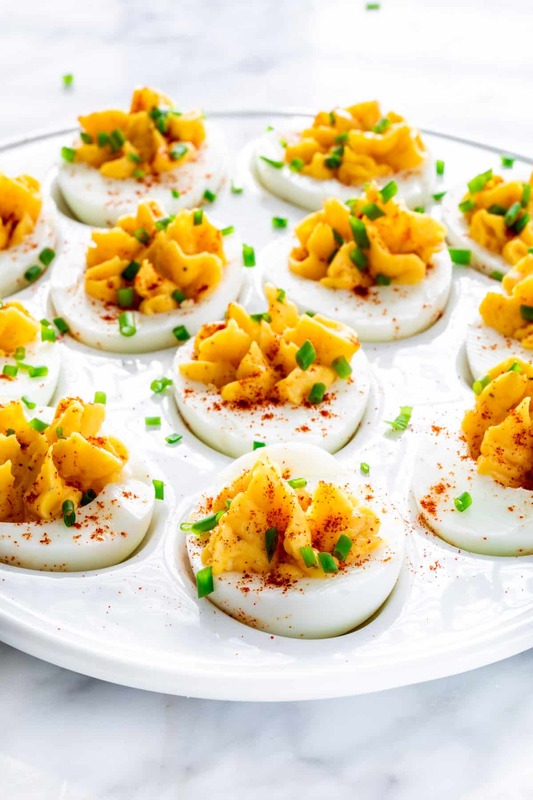 Garnish and serve: Sprinkle each deviled egg with paprika, garnish with chives and serve. These deviled eggs are great for making ahead up to 2 days in advance. However, the secret is to keeping the whites and egg yolk mixture separately and then the day you want to serve them, fill them with the filling. Wrap the egg whites tightly with plastic wrap. Store the egg yolk mixture in a small ziploc bag, and then when you’re ready to fill the whites, simply cut off a corner of the bag and use it as a piping bag to pipe filling into the whites. Eggs are a perishable food item, so you must keep them chilled at all times. Store them in an airtight container and refrigerate for up to 2 days. Unfortunately they will not last more than 2 days. Honestly, I wouldn’t recommend freezing deviled eggs. Even if you did, I don’t think they will taste as great as when you make them. Some things are just not meant to be frozen. Slice egg whites: Slice the eggs in half lengthwise and spoon out the egg yolk to a bowl. Place the egg whites onto a clean dry plate or platter. Make the filling: dd the rest of the ingredients to the bowl, with the exception of the paprika and chives and mash everything together. Fill the eggs: Using a small ice cream scoop fill the egg whites with the filling. Alternatively, you can use a teaspoon or a piping bag to pipe filling into the egg whites. 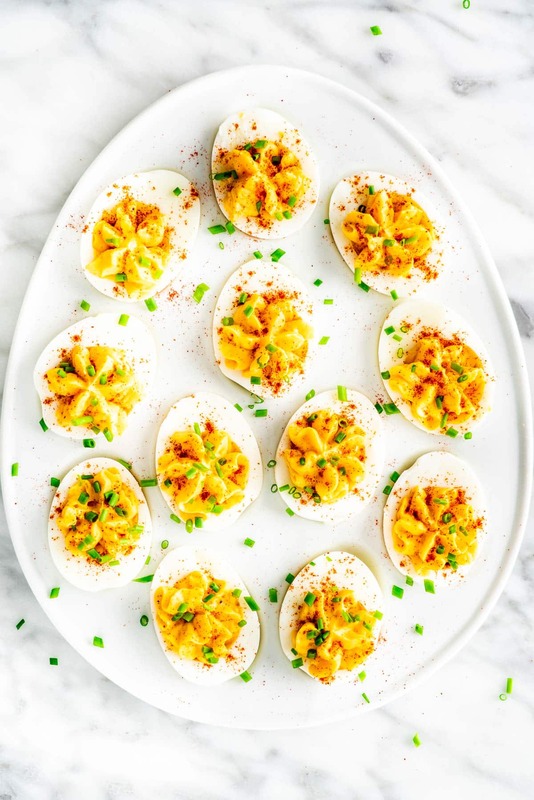 Garnish and serve: Sprinkle each deviled egg with paprika and garnish with chives. Bring the water to a boil. Don't let the eggs sit in the water as it comes up to heat - wait until the water is hot. Drop the eggs in cold - straight from the fridge. Don't let them come to room temperature first. Also, avoid using any eggs that have a hairline fracture. It will become apparent right away when you place the egg in the water. Transfer the eggs immediately to an ice bath. Make sure there's lots of ice so the heat from the eggs doesn't reduce the temperature of the water. Let them sit in the ice bath for 10 minutes. Lightly tap all around the eggs to crack their shells. Carefully peel pieces of the shell away using your thumbs. Underneath you'll have a perfect hardboiled egg! Leftovers: Eggs are a perishable food item, so you must keep them chilled at all times. Store them in an airtight container and refrigerate for up to 2 days. Unfortunately they will not last more than 2 days. Use softened goat cheese in place of half of the mayo. That sounds great! I know not everyone likes goat cheese, but for those who do that would be a treat.